Tucked away in the heart of central Oregon lies an extraordinary escape, *The Residence Club at Pronghorn*, where mountains glisten in the high desert air and fairways beckon just outside your bedroom window. Buffered by the craggy Cascade Mountains, Pronghorn's gentle climate is a golfer's dream. Every hole at the Jack Nicklaus Signature Golf Course was designed with nature in mind- you'll tee off against a backdrop of snow-dusted peaks and 20,000 acres of protected land. Beyond the fairway, whether you indulge in an aromatherapy massage at the Spa, relax by the lava rock pool with a favorite book, or embark on a once-in-a-lifetime adventure on a Cascade Mountain trail, you'll be at one with the serenity of your breathtaking surroundings. A sportsman's paradise, nearby Mt. Bachelor is home and training site for the Olympic Snowboarding Team, and Pronghorn's Jack Nicklaus Signature Golf Course was voted "One of the Top Two Best New Private Courses in the Country," in 2007 by Golf Digest Magazine and "One of the Top Ten Best New Courses in the World," in 2008 by Travel & Leisure Golf. 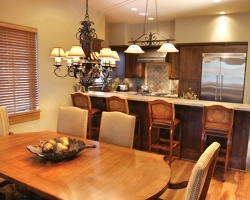 In addition, hospitality and relaxation are key themes at Pronghorn, and a special ski bus transports guests to Mt. Bachelor and offers cocktails on the way home. Enjoy the use of FOUR floating weeks per year: 2 summer & 2 winter weeks! Extra weeks are only $400.00 per week! HOA dues paid thru March 2019!